Hello people. We hope that you are fine and here are the season greetings for you all because we want you to enjoy to your maximum and live up to all the festivities that are coming and recurring. It is that part of the year which makes us all happy and we never get enough of it. Well the most awaited event is the Apple event, to be honestly, it is something inevitable and we keep our fingers crossed to see what new things are in store for us all. And every year it surprises and makes us bewildered at the way technology goes on escalating and the way it manifests that Apple is phenomenal. 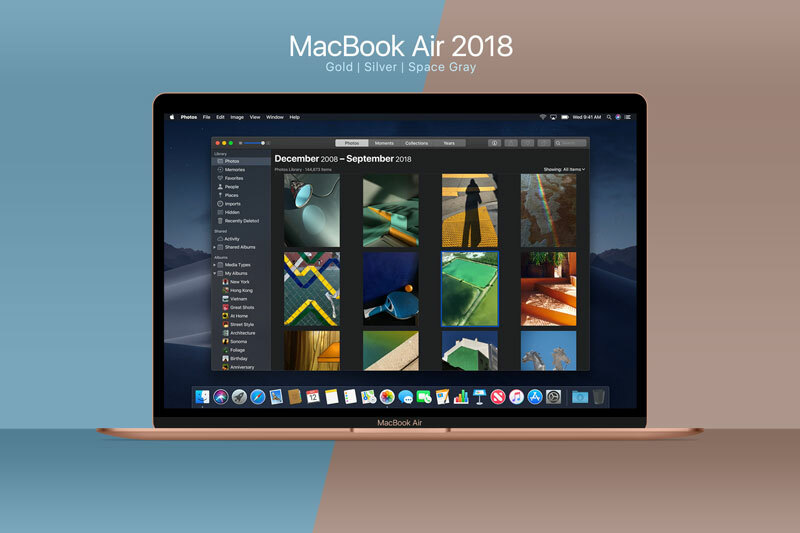 Down here you will see the new thinner MacBook Air 2018 Mockup that you can use for both commercial and personal projects. You can also put it on the blog/website to showcase a wallpaper/image or application. Through this mockup it will be easier to understand how the document/image or file will appear in the tangible form. As far as Apple MacBook is concerned it is the thinner version that has ever come into this world. You will not believe on its look and how crisp it appears. The efficacy and potential it has, is wondrous and awe-inspiring. It has more power, more perfection, more performance and energy to deal with everything flawlessly. The stunning Retina display makes it more magical than usual, it also is a new level of portability. What do you guys say about it? Also, how can we forget its processor, memory, graphics and storage that makes it irresistible and yet so tempting for sure. For more amazing collection of art/design and technology we are sure that you will subscribe to the blog and will be getting the daily prompts. We are here to inspire you, aware you and put forward the stuff that is informative for you all. Stay tuned for the uninterrupted collection in future as well. Here we go with a hope that tomorrow will be exciting and bring before us all the possibilities and opportunities we have been looking up to.